Moving at the speed of business means having the information you need right when you need it. An enterprise content management (ECM) solution helps enterprises increase efficiencies by automating and speeding business processes to streamline workflows and improve services. 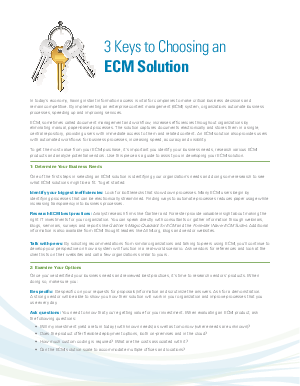 When you’ve determined that ECM is the solution to eliminate paper-based processes in your organization, take a look at this guide to learn the most important things to consider.